Rated 5 out of 5 by Contractor from Started right up after sitting for years I purchased new from a big box store over 3 years ago. I used it for 21 hours straight during a power outage after a storm. After power was restored I drained the fuel and changed the oil and stuck it in the back of my shed. Fast forward to 2018 and I decided it was time to pull it out to make sure it still works. I changed the oil, added fuel and on the second pull it fired right up. Thanks Generac. Quality products are hard to come by anymore. Rated 5 out of 5 by Hampster from Easy to use Easy to assemble and very easy to use, fired right up and works great. Rated 5 out of 5 by ray1956 from This is a great generator for the price!! My RS7000E was purchased online for an excellent price. It was delivered on time right into my garage. I then assembled the wheels, etc., filled up with oil and gas, and trickle charged the battery overnight. Then I simply pushed the button and it fired right up within 2 seconds!! I tested all the outlets and let it run for one hour and put it back in the garage. Living in Florida in the summer, a generator is a must-have. I'm sure my electric start RS7000E will power up everything I need, including a room A/C unit to please my wife!! A great product!! Rated 5 out of 5 by Arthur from Affordable and easy to use back up power I have owned a GP5000 for several years to use as emergency back up power. I recently upgraded to the RS7000E to use for back up power for our house when plugged into a transfer switch that we had installed. I chose the RS7000E because of the electric start feature and because our electrician said a larger generator would meet our needs better. We recently had our first power outage since we installed the transfer switch and got the RS700E. Due to a storm we had a power outage that lasted 30 hours. The RS7000E was easy to use and ran for 10 to 12 hours on one tank of gas. It's not a full house back up but we had all the important things that require electricity including our well, furnace and hot water, hard wired smoke detectors, our refrigerator and freezer, and our home's air exchange ventilation system, our Internet and TV, and a number of lights and wall outlets. I would not say the generator is particularly quiet but we are very happy with this product for the price of under $1,000 vs. an estimate of more than 12x that for a full house propane system. Rated 5 out of 5 by jump3mb from RS7000 My wife and I bought this as home backup for power outages. We live on a deadend street right on Lake Ontario and know if we lose power we might not have it for awhile. We bought a Generac for the brand name. I bought this one because we have individual electric room heaters and a tankless water heater. We just had a wind storm yesterday and luckily didn't need it but fired it up two days and tested it out. Yes its somewhat noisy but its a generator...what do you expect. I did try running different arrangement of things on it and I will say the tankless hot water heater definitely ate up a lot of the power. Overall though the generator worked as expected and is easy enough for my wife to operate in a pinch. The one thing that would have been nice is to have a current monitor that will tell me the amperage draw on each leg. Other than that though so far it seems to be a solid unit and will definitely get us by if we lose power! Rated 1 out of 5 by CJ from leaked gas all over my garage when stored! I bought this generator though an internet company, first mistake. Received the generator put it together started an ran fine. Stored it in my garage and the first night it leaked gas all over my garage. I took it to local generac dealer, they said it was because it had debris in the carburetor. Not covered by warranty by generac. I used brand new gas, only ran it once and stored it 1 night. The Generac company was not helpful at all, gave me the run around where I had to call 3 times and after promises to call me back I never heard back. Finally on the 3rd call I was told it wasn't under warranty although it was brand new and only ran once for 15 minutes. 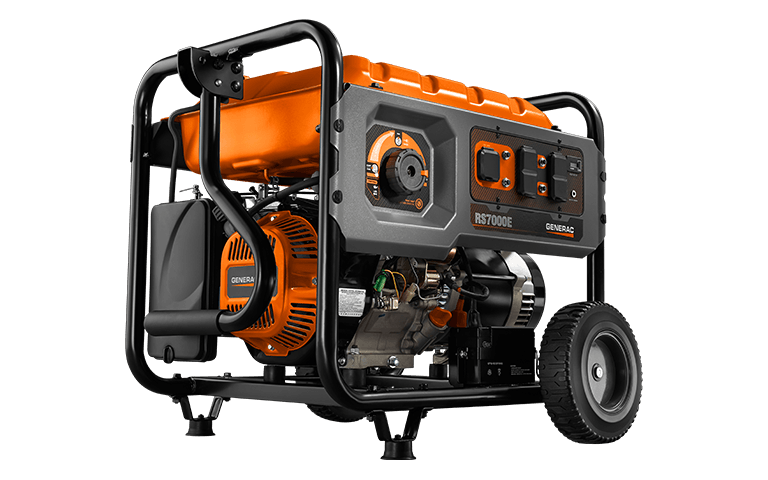 I would never recommend this Generator just based on how I was treated by Generac Company and I think I got a lemon that is costing me way more than the $1000 I aid for it in the first place, my brother bought a generator for 1/2 the price locally that is not a known brand, he has had no issues. This one definitely not worth the money and Generac did not stand by their product. At the very least do not buy from internet dealer, I wouldn't recommend Generac product just based on the their treatment of customers. RS7000E is rated 4.6 out of 5 by 25.